RadioBOSS Cloud – all in one internet radio streaming solution. 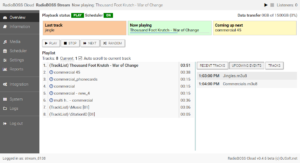 RadioBOSS Cloud is a web-based radio automation system. Typically, web-based AutoDJ systems have limited features, have ridiculous limitations and are only good as a backup solution. RadioBOSS Cloud is designed to change this by offering a feature rich and easy to use web-based radio automation solution. 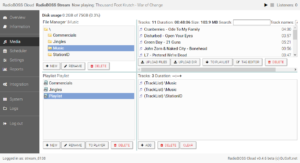 RadioBOSS Cloud offers everything that is needed to start an Internet radio station in minutes! 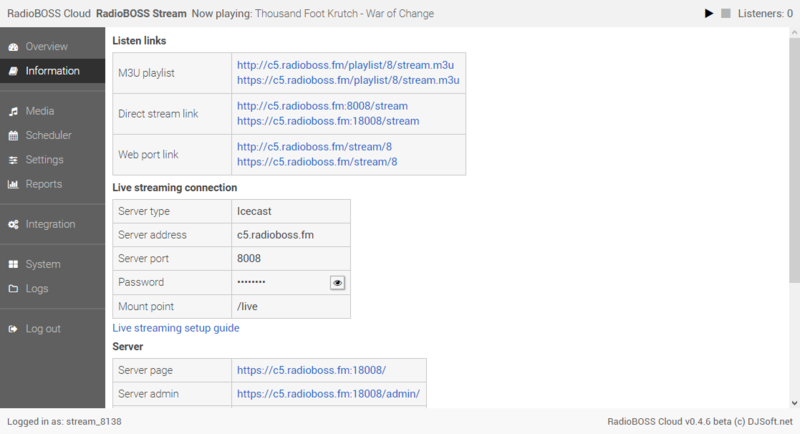 To get started, please see our Getting Started with RadioBOSS Cloud guide. All RadioBOSS Cloud guides can be found on our support page. Easy to use web-based, mobile friendly control panel. Live streaming and unattended operation. Features seamless, automatic live/autodj transition. Supports any number of playlists and any folder structure to organize tracks. Drag-n-drop media management. FTP uploads. Build any number of rotations. Track selection with repeat protection rules (track, artist, title separation). Powerful scheduler: schedule events to start at a set time, day, day of week, week number. Recurring events and events with advanced actions are supported. Various queue options are available: start at the exact time, wait until the current track finishes, insert after the currently scheduled block. Schedule events using your local time zone. Automatic, configurable crossfading. 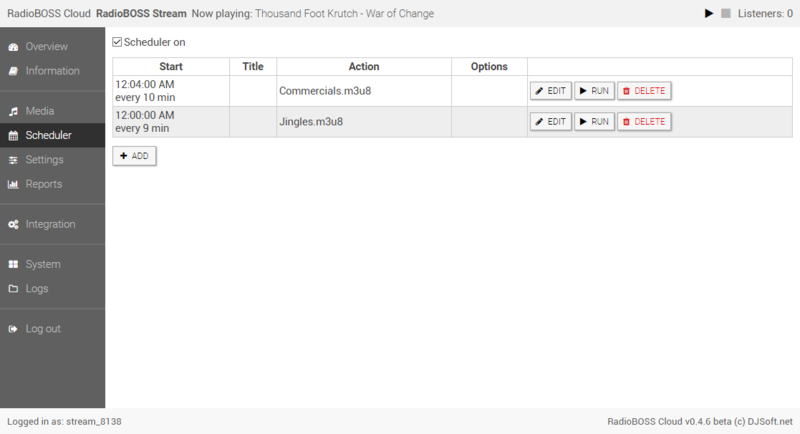 Customize crossfade settings for certain track types: adverts, station IDs, etc. 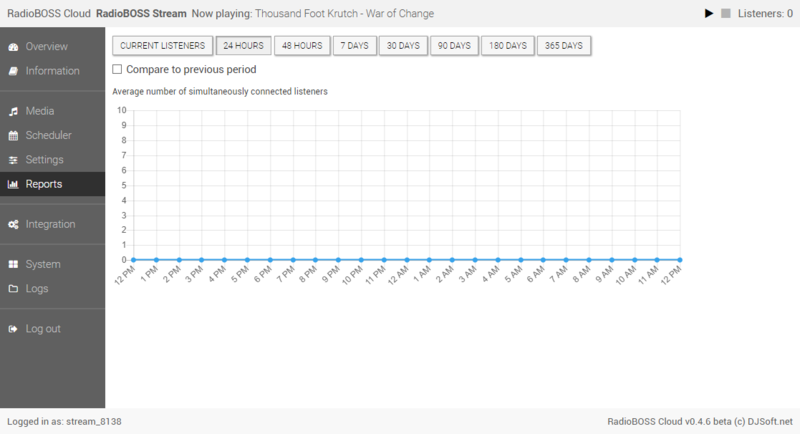 Listener number reports for up to 1 year; compare listener numbers to previous period. 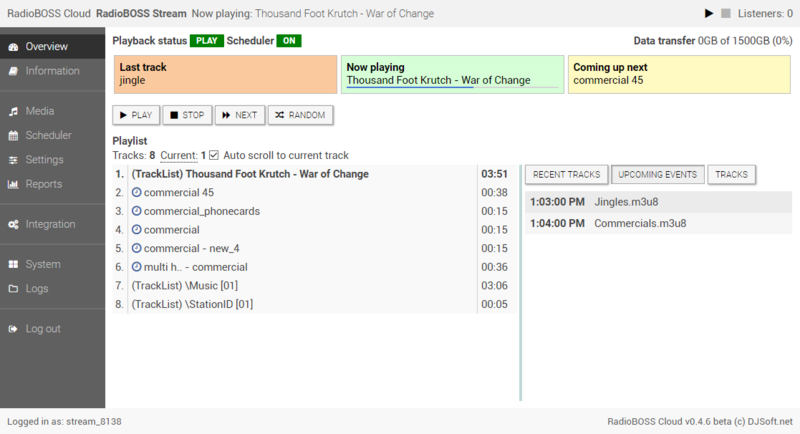 Monitor what’s playing: control panel shows the current and upcoming track titles. View and modify playback queue. Supports all popular audio file formats: MP3, AAC, WMA, OGG, FLAC, ALAC, M4A, OPUS, and others. Relaying network streams – start and end relaying according to the schedule. Automatic silence trimmer: remove silence from the beginning and end of music tracks. Broadcast in MP3, AAC/AAC+, OGG, FLAC, OPUS. Any bitrate, sample rate, mono or stereo; HTTP and HTTPS tune-in links. Broadcast to any 3rd party external streaming servers, Icecast or Shoutcast. Sound processing, automatic volume leveling. Widgets to integrate stream to a web site: player, nowplaying title, recently played tracks, album cover and others. Integration with third party services: TuneIn, Twitter. Exceptional reliability: multiple levels of automatic monitoring and recovery ensure that your radio station always stays online. We’re open to any suggestions, feature requests or bug reports, please visit this forum topic to take part in the development process.